Frenchman Romain Bardet (Ag2r) launched a solo attack in the mountainous finale of Critérium du Dauphiné stage five to take a solo win in Pra Loup. With such a daring lone move on a stage that is a virtual carbon copy of one in this year’s Tour de France, Bardet has elevated his name among the Tour’s big contenders. American Tejay van Garderen (BMC Racing) finished second to take the overall race lead. Chris Froome (Sky) finished in third on the stage and fellow British rider Simon Yates (Orica-GreenEdge) in fifth. Bardet’s attack over the top of the penultimate climb and the resulting chase by Team Sky saw several notable riders fall by the wayside, including 2014 Tour de France champion Vincenzo Nibali (Astana). 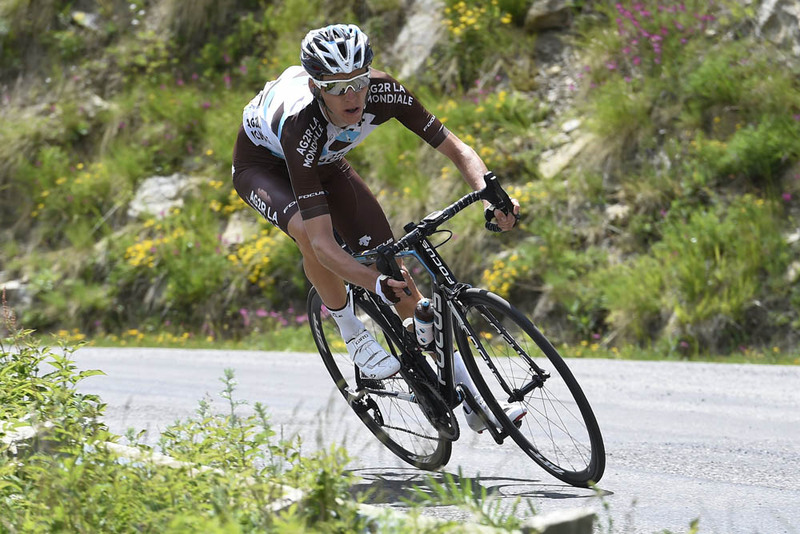 Bardet – sixth overall in the Tour last year – attacked over first category Col d’Allos, he opened up a sizeable gap on the tight, twisting descent. By the time he hit the base of the final climb to Pra Loup after an on-the-limit descent, he had one minute and 20 seconds in hand over the 30 or so riders left in the peloton. Former race leader Rohan Dennis was one of those dropped on Col d’Allos, his spell in the yellow jersey over. Team Sky led the peloton on final climb, setting a fast pace that saw more and more riders dropped out of the back but still they did not eat into Bardet’s lead. Nibali was the biggest surprise casualty of the pursuit, pulling over to the side of the peloton with three kilometres to go. Alejandro Valverde (Movistar) and Wilco Kelderman (LottoNL-Jumbo) were also among those dropped. As Wout Poels and then Nicolas Roche did their turns for Sky at the front, Froome attacked in the final two kilometres. Only van Garderen and Beñat Intxausti (Movistar) attempted to chase. 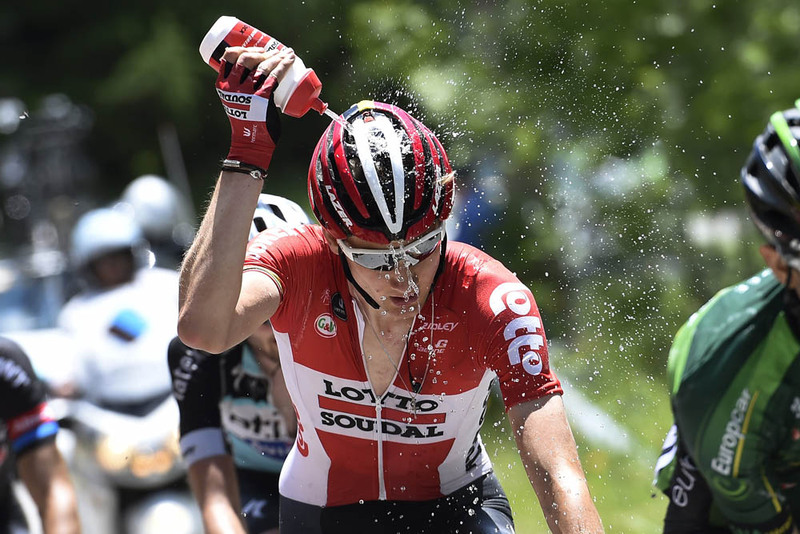 After Bardet took the victory up front, van Garderen managed to catch and pass Froome to take second place, and assume the race lead from team-mate Dennis. Intxausti moves up to second overall, 18 seconds behind van Garderen with stage winner Bardet up in third place at 20 seconds. Froome is fifth overall at 41 seconds, and Yates sixth at 44 seconds. Earlier in the day, the escape group of Arnaud Courteille (FDJ), Christophe Riblon (Ag2r), Pieter Serry (Etixx-QuickStep), Romain Sicard (Europcar), Albert Timmer (Giant-Alpecin), Daniel Teklehaimanot (MTN-Qhubeka) and Tim Wellens (Lotto-Soudal) had navigated the stage’s opening three categorised climbs out front. Teklehaimanot gained more points in the King of the Mountains competition to retain the poka-dot jersey. They were all caught on the Col d’Allos. Friday’s stage six sees another climb-peppered day from Saint-Bonnet-en-Champsaur to Villard-de-Lans over 183km. Sky looked the stronger team during stage five, and Froome’s attack overhauled everyone bar van Garderen, but they will have to keep the pressure on over the next three days to make up Froome’s time deficit and secure the win.